Restful sleep is crucial for our bodies to run optimally. For thousands of years Traditional Chinese Medicine has used the meridian system to help restore healthy sleep patterns. The exercises below, from Donna Eden’s program, can help you release tension and return to calm. 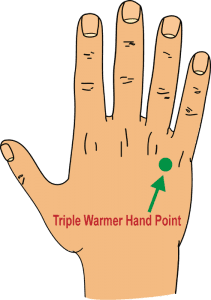 Push your fingers into your shoulders, and when you are ready drag them over the top of your shoulders and smooth them to the middle of your chest over your heart. This exercise can calm anxiety and worry. Tap into the groove while thinking of stress (You can also rest your flat hand on your heart and tap in the groove.). 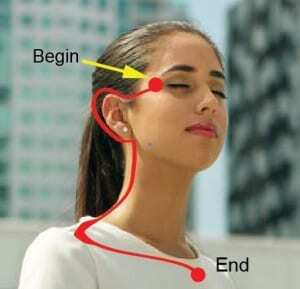 Tracing the meridian backwards can reduce excess energy and can bring a sense of relaxation and calm to the body. It is very helpful right before going to sleep. This exercise is helpful if one is feeling overwhelmed or not sleeping well. This exercise is good to do when you wake up in the middle of the night and cannot fall back to sleep. A calming method suitable for anytime of day.